Hidden away in the little known Barbaresco village of San Rocco Seno d’Elvio, just outside Alba, is the single plot of 4 hectares (of Nebbiolo, Barbera & Dolcetto) farmed by Manuel Marinacci. A mere 1.5 ha of which lies in the Barbaresco MGA of Rocche Massalupo. 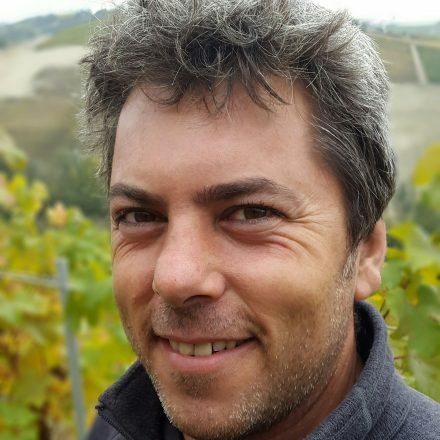 Manuel’s a young wine producer whose biggest claim to fame to date is as a class-mate of Giuseppe Mascarello at Alba’s viticultural school Umberto 1, which he left in the mid 1990s. 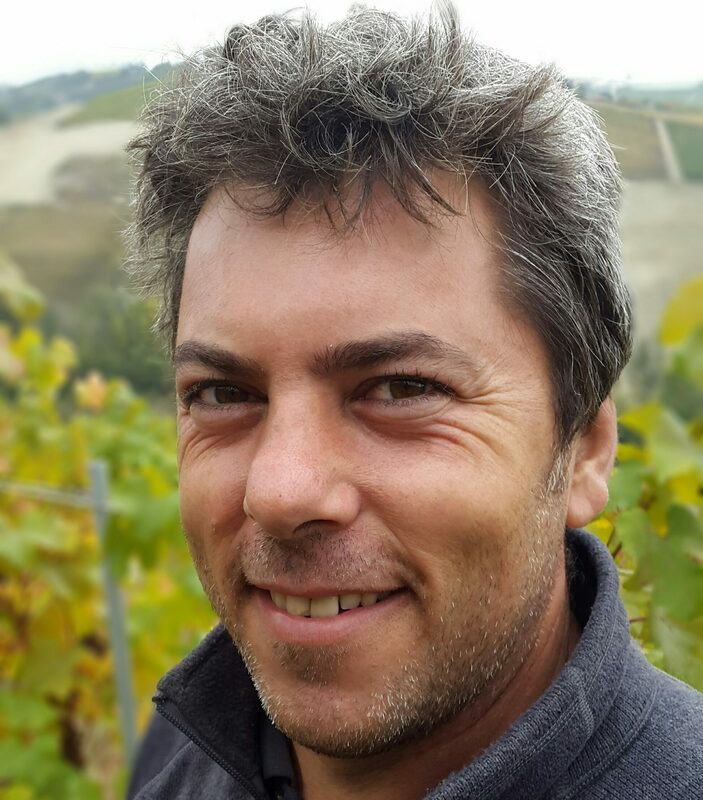 Upon graduation Manuel worked abroad & locally for both large and small cantine/wineries before taking on the lease of the San Rocco Seno d’Elvio vineyard in 2002. Vintage 2004 was his first release. Manuel makes three wines: Dolcetto d’Alba, Barbera d’Alba and Barbaresco. Refreshingly Manuel immediately adopted the traditional approach to winemaking; Giuseppe’s influence perhaps rubbing off on him! His Nebbiolo for Barbaresco is vinified in either fibre-glass or cement without temperature control using selected or wild yeast. As he explains: ‘as a two-man operation I need the comfort of knowing that the ferments will happen when I’m away from the cantina’. The Barbaresco is then aged in large slavonian botte for two years. Importantly he only vinifies that that is going into bottle with his name on it (rather than making wine out of all the crop and selling off any surplus as bulk wine); the rest is sold as fruit. So currently production of Barbaresco is at a third of capacity, circa 500 cases per annum. The style of Manuel’s wines are grounded in tradition, showing a kirsch purity & minerality normally associated with the comune of Treiso above. From 2017, his Barbaresco will feature the MGA/vineyard name of Rocche Massalupo. > Converting to organic. Bottling at 60mg/litro total & 30mg/litro free sulphur. 2018 Dolcetto d’Alba, San Rocco Seno d’Elvio – a gorgeous violet tinted & scented, graphite & blackberry coulis, rich but refreshing, reminding us that this area is famed for Dolcetto! 2017 Dolcetto d’Alba, San Rocco Seno d’Elvio – tasted July’18 from tank prior to bottling; inky purple, 15%+abv! Crushed violets, emphatic, TA5.2, hence juiciness, sumptuous too! More perfumed than the meatier 2016. 2016 Barbera d’Alba, San Rocco Seno d’Elvio – the quality of this unoaked/cement & stainless-steel fermented Barbera is surely down to the wonderful 1ha plot that sits on a glistening white shoulder high up above the cantina, facing south! Here the 30 yo vines produce loose bunches of small grapes, thanks to the high calc content of the poor soil. The 2016 is tightly wound, finely poised, holding back as you’d expect from this prodigious vintage. Graphite. 2015 Barbera d’Alba, San Rocco Seno d’Elvio – from arguably Manuel’s finest spot, high up on the Massalupo vineyard, on a bright white shoulder facing full south, planted in 2002…tasted from tank April ’18, 14.9%abv, pretty yet generous & fleshy, rich plum skin, grasso/fat yet alive, great presenza & texture. Alive! Molto buono…can’t wait to see it in bottle in Sept’18! …retasted July’18, lovely plum/brambly colour, sumptuous, deep, leather, warm earth, coffee bean, TA7.5 freshness. blueberry, elegant & refined as his Barbaresco! 2017 Barbaresco Rocche Massalupo, San Rocco Seno d’Elvio – harvested 27 Sept, tasted from botti July’18, 15%abv, TA5.6, vintage required few (3/4) treatments, bright, fresh, juicy, blueberry violet cream fondent, crushed minerals, such clarity, so pretty & alive. …retasted Nov’18, such was the vintage that Manuel’s yield was down 40% in 2017 (i.e. 4200 bts instead of 7k). No surprise then at the ripe red ‘bonbons’ fruit character, charming even now from botte, but still fresh & puro! 2016 Barbaresco, San Rocco Seno d’Elvio – later harvest than 2017, mid Oct, 14%abv, intriguing layers of red/black, rosemary & thyme, profondo, layered vs 2017, kirsch violets, ‘garriguey’ (as my Norwegian customer & friend Lars from Arendal Vintners accurately described it!) Complex. …retasted Nov’18, starting to blossom just in time for a Jan’19 bottling (! ), it’s gorgeously coloured, with pale red rose, the nose beguiles with flowing, haunting, ethereal, it’s pure rose petal, so cleansing, so pretty, so much at ease in its own skin (just like Manuel!). Rosewater essence. Pinch yourself, this is di-vine! 2014 Barbaresco, San Rocco Seno d’Elvio – harvested 28 Oct, TA5.9, 30 days on the skins in cement, 10% less quantity, tasted Dec’17, & Feb ’18 from tank prior to bottling in April’18; 14.5% abv, benefitting from the recent arrival of two new botti grandi, & from the more clement conditions enjoyed by Barbaresco in 2014 (50% less rain than in Barolo, & no hail! ); 3 years affinamento in legno/botti, racked once a year, before being bottled with c. 60 mg total & 30 mg free sulphur; suave, refreshing, & fine racy nose of rose-mary, glacier Amarena cherry & alpine herbs; very fragant, cool crunch taste, with crystalline cherry, juicy wild ribes, the finest of tannins, mouth-wateringly pure, cosi limpido, delicious even now, Pinot-esque…bravo Manuel! ..retasted July’18 from bottle, complex, fascinating, leaf litter, black tartufo, quinine, leather, walnut, earth, a mesh! Needs time to overcome bottling. 2012 Barbaresco, San Rocco Seno d’Elvio – bottled Sept ’16, lovely pure expression of Barbaresco, coming from the little known village of San Rocco Seno d’Elvio just outside Alba. Fermented in cement, followed by new & used botte grande, Manual has captured the vintage perfectly: glacier black cherry fruit, relaxed, fresh, pure, fine fruit tannins, a joy even so young.